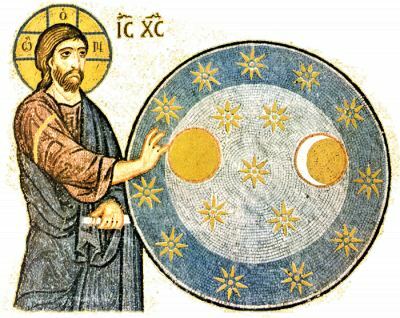 Genesis ends many generations later, with the account of Joseph in Egypt, who at first enjoyed the favor of his father Jacob, shown by the exclusive gift to him of the coat of many colors, above that of his other brothers, but they out of jealousy wanted to at first kill him but rather sold their brother Joseph into slavery to Ishmaelite traders, although he was innocent of any crime, and was made a servant in the household of Pharaoh, specifically to Potiphar, an official of the Pharaoh. Joseph was an innocent and pure young man, and with his innocence and purity he brought with him wherever he went and in whatever situation he was in the blessing of God. In his duties as a servant of Potiphar, he brought prosperity to his household and gained the favor of his Egyptian master. And we read in Genesis 39 that Potiphar entrusted all he had to Joseph, like God did with Adam in Eden. However, Potiphar's wife took notice that Joseph was "well-built and handsome," so she tried to seduce him. Joseph adamantly refused her offer, understanding that his master entrusted him with everything he had and he was deeply grateful for it, thus he could not betray his master's trust and "eat the forbidden fruit". 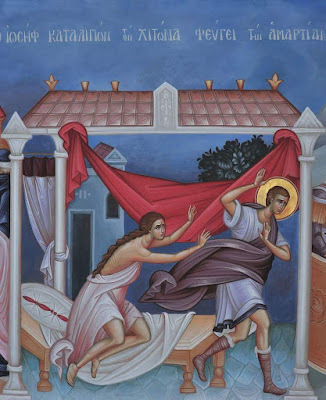 But then one day the wife of Potiphar found Joseph in the house alone, and she threw herself at him and grabbed his cloak to get him to go to bed with her, but he left his cloak in her hands and ran out of the house. When his master came home, his wife, realizing that her efforts were in vain, betrayed Joseph and falsely accused him of trying to do to her what she tried to do to him. For this Joseph was imprisoned on false pretenses and "banished from his little Paradise", but God remained with him, and blessed him, raising him to a position not only above that of Potiphar, but he was second only to Pharaoh himself in all of Egypt. And we read in Genesis 41:42: "Then Pharaoh took his signet ring from his finger and put it on Joseph’s finger. He dressed him in robes of fine linen and put a gold chain around his neck." 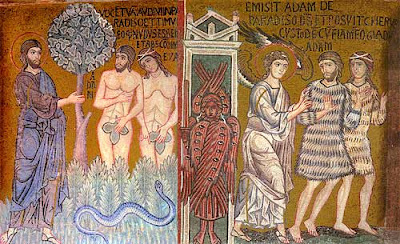 "The serpent finding the Egyptian woman as a second Eve, hastened through words of flattery to cause the downfall of Joseph; but he leaving his garment, fled from sin; and being naked, felt unashamed, as the first-formed before the disobedience. By his intercessions, O Christ, have mercy on us."